Staff and volunteers at Edinburgh’s Royal Blind School put on a unique exhibition last night at their highly impressive Craigmillar Campus, as part of National Braille Week. 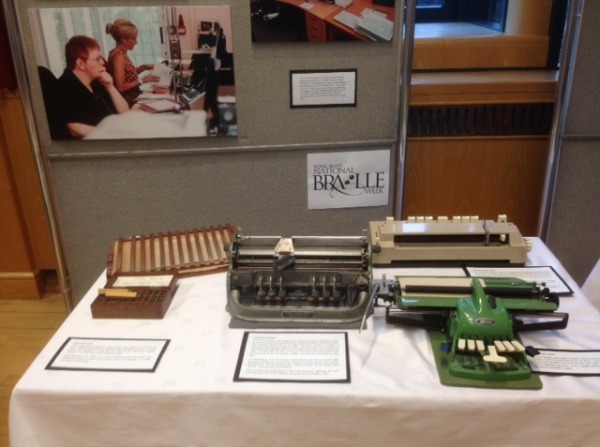 The well attended event featured informative displays highlighting the history of Braille including the innovative ways that Scottish charity Royal Blind has used it to communicate through the years. 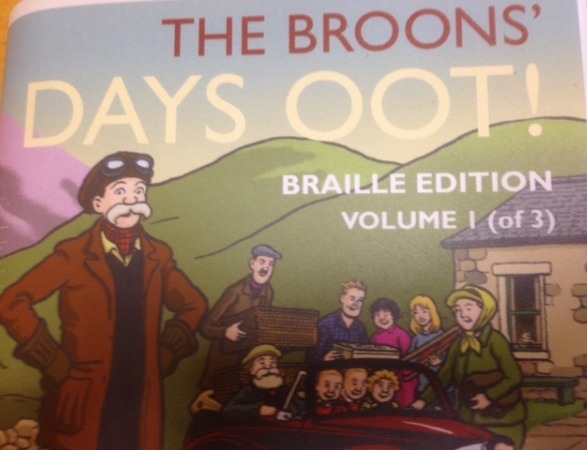 Numerous photographs and books were available, including a Braille copy of the ‘Broons’ Annual’ as well as an exclusive exhibition of Braille equipment such as The Tammery, The Braille Dymo Gun, The Stainsby Large and Small and the St Dunstan’s Braille Writer.Former pupil Jim McCafferty who now works for the Scottish Braille Press was on hand to demonstrate how the machines work. The Royal Blind School was founded in 1876 after the amalgamation of the Edinburgh Royal Blind Asylum which was founded in 1793 by Reverend Dr Johnston and the School for Blind Children which was founded by Edinburgh Printer James Gall in 1835. It is currently a national grant aided special school which provides specialist education to children and young people with a visual impairment, including those with additional support needs and multiple disabilities. Also based at the campus is the Scottish Braille Press which supplies Braille, large print and audio media to a wide range of commercial customers, improving access to mainstream services such as banking and education for thousands of visually impaired people. In addition, it produces Braille books and its own series of magazine titles and provides opportunities for the employment of visually impaired and disabled workers. The event was formally opened by Royal Blind’s Chief Executive Richard Hellewell who welcomed everyone for attending and praised the staff including Head Teacher Elaine Brackenridge and the volunteers for their hard work. He also gave an informative presentation on the work of the school, before introducing former pupil and renowned paralympian Libby Clegg who was recently named School Ambassador. Libby is one of Great Britain and Scotland’s most successful track and field athletes of recent years with Paralympic Games silver at 100m in Beijing, World Championships gold and European Championship gold to her name. The 23 year old is a proven performer at elite level, and with the Glasgow 2014 Commonwealth Games and the 2016 Rio Paralympic Games already on the horizon, she is training hard for more medal glory on the international stage. The Cheshire born raised sprinter who moved to Newcastleton in the Borders at the age of 12 is registered blind. She quit her base at Edinburgh’s Meadowbank Stadium three years and now trains six days a week along-side a number of leading Olympic prospects at UK Athletics’ centre of excellence in Loughborough, where the facilities including indoor and outdoor tracks as well as sports science and medical teams. Libby was a residential pupil at the school from 2002 until 2008 and spoke fondly about her time there, although she did modestly admit that her knowledge of Braille was not particularly good. She told the audience: “This is a real community. I didn’t realise how much the Scottish Braille Press actually did even though it was next to my residential house when I was here. 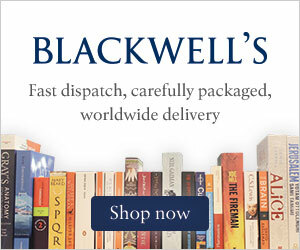 I think people don’t realise how much it gives to people, such as independence confidence, equal opportunities, the right to education and I think it’s really special what the Braille Press do and I would like to thank them for that. 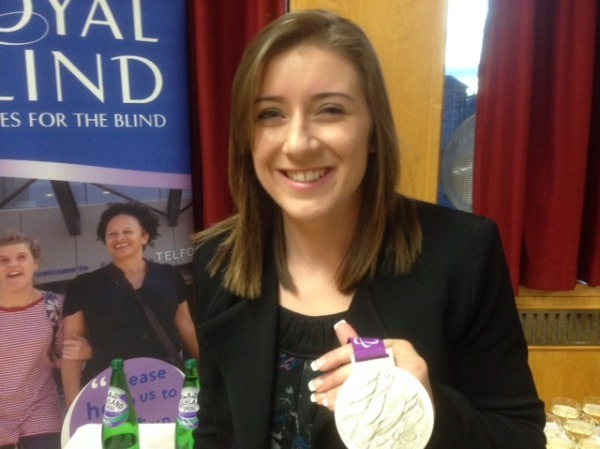 This morning, Libby will visit Cramond Primary School where she will give a brief talk to the school children then answer questions, and the pupils will have a chance to see her Paralympic medals as they get passed round the class.